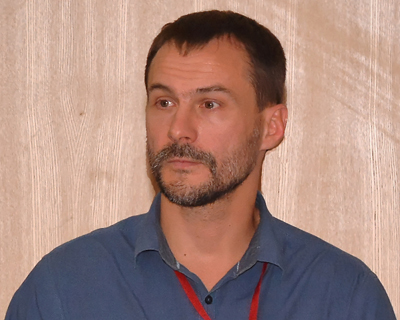 Born 12 March 1974 in Kaliningrad, USSR (former Königsberg, East Prussia, Germany). I am interested in circadian and circannual regulation of nocturnality in passerine migrants whose fascinating adaptivity to seasonal changes we may observe every year. Flying at night and feeding at day time need a specially tuned rhythmicity of the whole organism during migration. However migration is not a fascinating phenomenon only we may see twice a year. Migratory birds of Palearctic who may cover half a globe during their migration are regular visitors of warm and moist regions full of different pathogens. Being infected they become dispersal vectors of different diseases. My second project is focused on behavioural adaptation of birds that were infected by blood parasites and some aspects of parasite transmission. Avian malaria: how haemosporidian invasion affects behaviour of infected bird. 1997―2001: research assistant at the Biological Station Rybachy, Zoological Institute RAS. 2004: Awarded a Ph.D. on "Postfledging movements of young Reed Warblers (Acrocephalus scirpaceus)" from the Zoological Institute RAS, St. Petersburg. 1996: Master of Science in Biology from Kaliningrad State University. Master and bachelors' course in Baltic Federal University. 2013 – present. Masters' course in Baltic Federal University. 2013. Mukhin A., Palinauskas V., Platonova E., Kobylkov D., Vakoliuk I., Valkiūnas G. 2016. The Strategy to Survive Primary Malaria Infection: An Experimental Study on Behavioural Changes in Parasitized Birds. PLoS ONE 11(7): e0159216. Kobylkov D., Kosarev V., Mukhin A. 2014. Fuel for the road: the pre-migratory fuel loading of adult Eurasian Reed Warblers (Acrocephalus scirpaceus). J. Ornithol. 155(4): 979–986. Ktitorov P., Tsvey A., Mukhin A. 2010. The good and the bad stopover: behaviours of migrant Reed Warblers at two contrasting sites. Behav. Ecol. Sociobiol. 64: 1135–1143. Mukhin A. Grinkevich V., Helm B. 2009. Under Cover of Darkness: Nocturnal Life of Diurnal Birds. J. Biological Rhythms 24(3): 225–231. Mukhin A. Chernetsov N., Kishkinev D. 2008. Acoustic information as a distant cue for habitat recognition by nocturnally migrating passerines during landfall. Behav Ecol 19, 716-723. Bolshakov C.V., Chernetsov N., Mukhin A., Bulyuk V., Kosarev V., Ktitorov P., Leoke D., Tsvey A. 2007. Time of nocturnal departures in European robins, Erithacus rubecula, in relation to celestial cues, season, stopover duration and fat stores. Animal Behaviour 74: 855-865. Chernetsov N., Mukhin A. 2006. Spatial behavior of European Robins during migratory stopovers: a telemetry study. Wilson J. Ornithol. 118 (3), 364-373. Мухин А., Мухин А.Л., Чернецов Н.С., Кишкинев Д.А. 2005. Песня тростниковой камышевки Acrocephalus scirpaceus (Aves, Sylviidae) как акустический маркер водно-болотного биотопа во время миграции. Зоологический журнал 84: 995-1002. Mukhin A., Kosarev V., Ktitorov P. 2005. Nocturnal life of young songbirds well before migration. Proc R Soc B 272: 1535-1539. Mukhin A. 2004. Night movements of young Reed Warblers (Acrocephalus scirpaceus) in summer - is it postfledging dispersal? Auk. 121 (1): 203-209. 2010: 25th International Ornithological Congress (Brasil). Symposium talk "Environmental factors trigger changes in diel activity patterns in Eurasian reed warblers during breeding period." 2009: 7th Conference of the European Ornithologists' Union (Switzerland). Symposium talk: "Habitat recognition by nocturnally migrating passerines during landfall: the use of acoustic information and consequences of a right and wrong choice." 2007: 6th Conference of the European Ornithologists' Union (Austria). Symposium talk: "Nightlife of diurnal birds." 2003: Forth Conference of the European Ornithologists’ Union, Chemnitz, Germany. Oral presentation "Postfledging night movements of Reed Warblers – telemetry study"
2001: Third Conference of the European Ornithologists’ Union, Groningen, The Netherlands. Oral presentation "Mechanism of realization of juvenile dispersal in the Reed Warbler Acrocephalus scirpaceus: its relationships with internal state and environmental conditions". 2001: International Meeting "100 Years of Ornithological Research on the Courish Spit". Rybachy, Russia. Oral presentation "Juvenile dispersal of the Reed Warbler Acrocephalus scirpaceus: new interesting facts". 2001: International Conference (XI Ornithological Conference) "Current problems of study and preservation of birds of East Europe and North Asia". Kazan, Russia. 1999: Second Conference of the European Ornithologist’s Union, Gdansk, Poland.